According to the Centers for Disease Control, Alabama, Tennessee and West Virginia – in that order – lead the nation in prescriptions for narcotic painkillers. Nationwide, there were close to 60,000 deaths in 2016 from drug overdoses. How is this possible, when narcotics are strictly controlled? A popular target for blame for this problem is the pharmaceutical industry, which is often the focus of criticism. “We would not have a drug problem if manufacturers weren’t trying so hard to sell them,” the reasoning, such as it is, goes. But making and selling drugs is what drug manufacturers do: they spend millions or billions of dollars over a decade and often longer to find the right formula to create a product that will help people suffering from a medical condition. They work to get the product through lengthy clinical trials and the stringent FDA approval process. Then, they must sell enough of that product during the patent protection period to recoup the costs of its development so the company can invest that money in another product’s development. Also understand that drug companies do not provide addictive drugs to individuals, neither the legal users, nor the illegal users. They provide them to distributors, or directly to pharmacies, and unless someone steals them or distributes them improperly, they will contribute not one bit to a drug problem. Far too many prescription drugs do get to users through “pill mills,” and some physicians who don’t have sufficient information about the effects of some drugs as they need may, as a result, over-prescribe them. And, obviously, these problems must be addressed. However, a recent Daily Signal article tells us that the painkiller abuse problem is not primarily caused by prescription drug abuse and misuse, although the news we hear might convince many of us that drug companies are at fault. 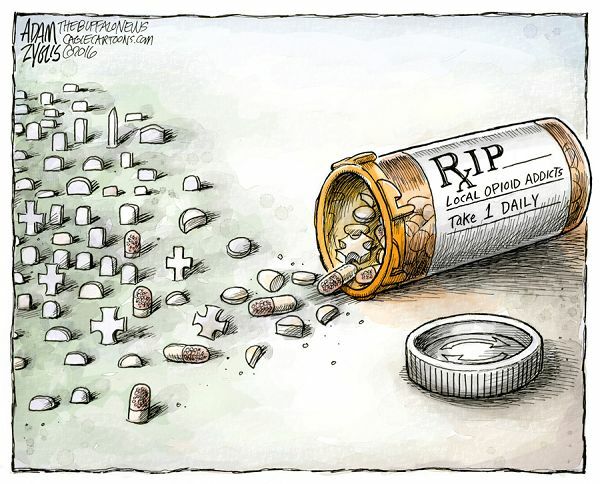 The article, written by former director of the Office of National Drug Control Policy, Bill Bennett, who is also a former U.S. Secretary of Education, and Robert L. DuPont, MD, president of the Institute for Behavior and Health, explains that of the 60,000 deaths in the U.S. in 2016 from drug overdoses, 33,000 of them were opioid related. And, they add that our news media mistakenly focus more attention on prescription drugs, instead of the illegal ones. Is that because Big Pharma is an easy and popular target? They cite data from the Obama administration’s press office in 2015 saying that there were 33,091 opioid overdose deaths, 12,990 of which were from heroin. Another 9,580 were from synthetic opioids, mostly illegal fentanyl. They propose a two-phased attack on the problem. First, fight harder against illegal drugs coming into the U.S. through better border enforcement to stop the drug traffic from and through Mexico, as well as working to have Mexico eliminate its poppy crops; have stricter monitoring of international mail services; and crack down on cartel activity, both here in the U.S. and at their source. The second phase acknowledges that most money directed at the problem goes to “treatment, recovery, and urgent overdose reversal,” which they say is certainly important, but it is not enough. “We need to improve engagement in treatment, reduce dropout, and address the far too common outcome of relapse with sustained recovery—meaning no use of alcohol, marijuana, or other drugs,” by recovering addicts. “But the main unaddressed nature of the opioid crisis,” Bennett and DuPont say, “is focus and energy on prevention.” This includes serious efforts to educate the public about what is in their medicine cabinets and how to keep those drugs out of the hands of those for whom they aren’t prescribed, and to educate the public about the dangerous nature of the drugs sold on the street. It is critical to also work to counteract the youthful use of alcohol, marijuana, tobacco and other drugs, where they say 90 percent of addictions begin. Citing the rising death toll from illegal drugs, which they note is much greater than the crack cocaine problem in the 80s, the authors call for more effective action by political leaders, parents, the entertainment industry and health care professionals. Certainly, focusing on the real problem will produce positive results.